My wife and I moved to Garden Valley Idaho in the Spring / summer of 2002. Tamara took a job with the US Fish and Wildlife service as a wildlife biologist. I tried to find a teaching job but found none. Our closest school had a graduating class around 20 so the amount of teachers and turnover was quite low. The next closest school was over an hour away. I began to look for work. I wanted either a cowboy job or a logging job. In July 2002 I headed to Pennsylvania to play a batch of concerts. When I returned there was a small logging crew working the woods near our Idaho home. I got off the plane on Sunday and was hired by Monday. Lee Daniel asked if he could have a few of the “trouble” trees hanging near by home. Windstorms had recently given us quite a scare with trees crashing through homes all around us. I struck a deal with Lee. He could have 2 of our Ponderosa Pines if he hired me on his crew. He started me at $10 an hour. My initial duties were to assist Lee as needed. Fetching tools and serving as a extra set of eyes when dropping trees near homes and roads. By August I was working full time and was now paid by production. I received $125 for each truckload of timber we shipped out. Lee owned his own truck and skidder that made the job a bit easier. His truck held about 5000 board feet of timber. By now my job was primarily as a “knot bumper.” Once a tree was felled, it was my job to remove all limbs and aid with skidding the log out to the log landing where all the timber was stacked until a full load was ready. This was done either with the giant hydraulic grabs on the back of the skidder or more often, by wrapping a “choker” around the logs and pulling them out with the skidder. A choker is a wire with a “bell” on it. The bell was a cast metal mechanism attached to the wire that would lock the end of the wire in place as so it can be wrapped around a log and secured. There were several bells on the “bull line” attached by “sliders.” Sliders allowed the bells to be moved up and down the bull line freely. We worked on the Garden Valley job through the summer and early fall. We then packed up and headed North about 2 hours to the town of Obsidian Idaho, about 15 miles East of Stanley. We were up in the Sawtooth National Forest near “Otter Creek”. This was truly amazing. We created a small rustic camp in a grove of Aspen trees. Lee Daniel and I usually were the only men around. We slept on the ground in the Sage brush. Lee was half Navajo Indian. He dug a hole in the ground for our cooking fire. We claims this way the heat will bake the walls of the pit into a hard clay that will hold the heat even better. In addition he said when done we could fill the hole in and come back in many years and reuse the original fire pit. We would usually cook eggs, toast, cowboy coffee, and chorizos. Cowboy coffee is coffee made by throwing a handful of coffee grounds into boiling water. To settle the grounds, we would drop one splash of cool water in. It worked quite well. With a few shots of Baileys Crème in the coffee we were ready for anything. Chorizos are a sausage that is outstanding. I was told they are a food of the Basque people of Idaho. The Basque people came from the North of Spain and Found Idaho to be a suitable place for ranching and herding. We would gas up the saws, sharpen the chains, load a few wedges in our pockets, and head into the forest. The main tree in this area was fir, I believe “Red Fir.” There were also a lot of Lodgepole Pine. The Lodgepole had been hammered by a beetle infestation. There were hundreds of acres where all the trees were dead. This was exactly why we got this logging job. The US Forest Service contracted this job out to remove some of the fire hazard. It seemed the trees at this job were either large Fir trees or rather small Lodgepole. The Fir was primarily sold off to local sawmills. 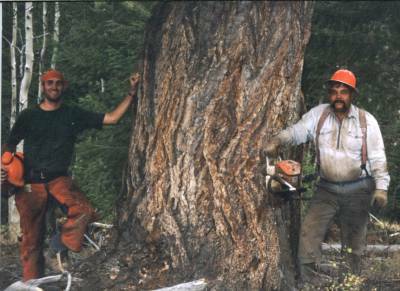 Our Lodgepole was kept by Lee Daniel to cut into firewood at his home in Emmett, Idaho. Much of the timber was over a steep hill. We often backed the skipper to the edge of the top of thee hill and then pulled the timber out using the bull line. My main job was to bump knots as Lee fell the timber. We would break for a quick lunch, then head back to work. We would usually spend the afternoons pulling the timber out and up to the landing on top. I would run to the top of the hill and grab the pull line. I would then pull the bull line down to the logs. I could wrap as many as 5 or 6 logs on one choker, and there were about 5 chokers on the bull line. On a few of the pulls we got 10-15 trees in one shot. As soon as Lee skidded one load up the hill, I would run to the top of the hill to be ready for the next batch. On some days we were able to get about 10,000 board feet of timber out (or about 2 truckloads). On other days we didn’t get any logs out due to machinery failure. On one occasion the skidder needed to have it’s hydraulic oil changed. I was given the task of draining the old oil. What I didn’t know was that a skidder holds a few gallons of oil. I crawled under the skidder and began to slowly unscrew the drain plug. My hope was to stop as soon as it started to drip and then carefully drain the oil at a controlled rate. Instead the plug popped out into the plastic bucket and oil began gushing from the giant metal beast. I watched as bucket after bucket filled with black oil. I was now left with the job of finding the drain plug in the bottom of one of the plastic buckets willed with used oil. In the bottom were sharp pieces of metal that had come out with the oil. As I plunged my hands past my elbow into the oil, I would get dozens of metals splinters in my hands until I finally found the plug. On another occasion we needed an engine part for the skidder. The closest supply store was 2 hours away in Sun Valley / Ketchum area. Although I made no income as we wasted time searching for parts, I enjoyed the trip as I got to see the outside world and throw down a few pints of beer. Lee and I would usually arrive at the camp in Obsidian on Monday, sleep over and head home Tuesday night. We would then Meet up again Wednesday and stay until Friday. I often worried about Tamara at home. Living out under the stars and cooking off a fire hours away from home may sound like a nice vacation, but that wears off after a few days of work. Lee had done it his whole life. 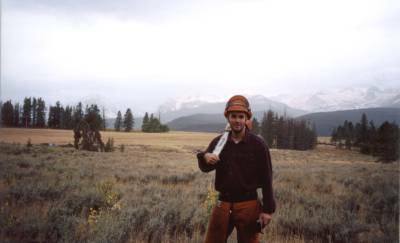 In addition to logging, Lee had been a cowboy, and I mean cowboy in every sense of the word. He rode the range in Nevada, Idaho, and New Mexico for much of his life. At night in logging camp, we would sit around the fire sipping Olympia bear as he would go on and on with story after story about his life. He was quite a fascinating man. Among the people he cowboyed with was a famous outlaw by the name of Claud Dallas. Claud had killed 2 Idaho Game Wardens in the 1980’s and had evaded capture for several years. Once captured, he escaped and went on the run again. In the parts of the West, this man was held in high regard as a piece of the real west that fought the government and won. In my opinion he was a killer, a poacher, and a thief. On some nights, we would head into the Salmon River Valley and visit the hot springs that occur naturally there. After a few days of hard work in the dust woods and sleeping on the cold ground, this hot water was pure heaven. We would then head into town and blow er’ in. Many of the men at the bar were loggers. The 2 bars we visited most were the Village Inn and the Kasino Club both in Stanley. It began snowing in August in this area of Idaho. Some days would reach the 80’s but most nights were cold and some were below zero. We finished this job around November and headed to another job in Redfish Campground closer to Stanley. While working on this job we stayed in a hotel in Stanley. It didn’t have the same atmosphere as sleeping in the Sage listening to Coyotes and Elk to the smell of coffee on the fire. By January we were snowed out and packed it in for the season. In December I was fortunate to find a job at Payette River Lumber. They ran 2 sawmills. Both were band saws. One was diesel powered and the other was electric powered. I worked as a laborer doing just about everything. Most often I was stationed on the “edger” where I ran rough cut boards (with natural edges) through a machine to cut them into standard widths. Work also included banding scrap wood and using the skid steer to move the banded scrap to the yard. We also stacked the lumber, both in the yard and in the kiln. The kiln was an old airtight shipping crate used on sailing vessels. We could get about 6000-1000 board feet in the unit. We then turned on a heater and a dehumidifier and shut the doors for a few days. One of my best friends on the crew was Daniel. He was a Mexican American. He and I seemed to get the worst jobs. The entire saw mill was outdoors and it got quite cold through the winter. If it snowed, we got soaked. We were often in mud up to our knees in the yard. After the lumber was in the kiln for a few days, a mold often bloomed on all the boards. Some, often Daniel and I, had to scrape / brush all the mold off. It would get in your eyes and lungs and make breathing quite difficult. Another job was peeling the bark off of Lodge Poll Pine trees. These logs were then sold to builders for interiors so all of the bark had to be removed. This work would have been quite easy if we did it in the springtime while the cambium layer was green. Instead, they had us peel logs that had been drying in the yard for months. It was very difficult work and by the end of the day your hands felt like they were cast iron. The main tool we used for this was a drawknife. I wish I could have had a PA bark spud used to peel hemlock bark years ago. This was pretty rough work all around. Not a minute went by that we were not lifting, running, stacking, or cleaning. Other than Daniel, I didn’t really enjoy the people I worked with at this Job. One day, for the first time in my life, I just up and walked off the job. It was mid March and I was pretty sick of the whole deal. I told the yard boss I was going home. He asked if I would be back tomorrow. I said no and headed home. It was a great feeling. It wasn’t the hard work I minded so much. It was the atmosphere. People were very disrespectful to each other and especially to my friend Daniel because he was Mexican. 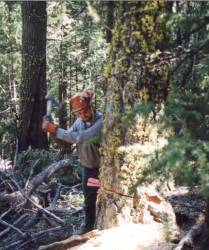 My work in Idaho, especially logging with Lee Daniel, was a great experience. Sadly, it seems like the great logging operations of the Northern West are becoming more and more rare. Over the last few decades, many companies have packed up and headed to other countries, like Canada, where regulations are much more relaxed. While I was in Idaho I watched the last Boise Cascade sawmill in Idaho be demolished. The timber is still there, the loggers are still there, but the industry is shrinking each year.